This stylish leather pen holder is an elegant accessory designed to suit anyone. This durable, yet classy leather case fits two standard pens and makes for a great addition to your accessories. Handmade to last a lifetime, this accessory will get better with age and become a valued and much-loved item. The perfect size to be taken with you out, this pen holder is the ultimate everyday accessory. 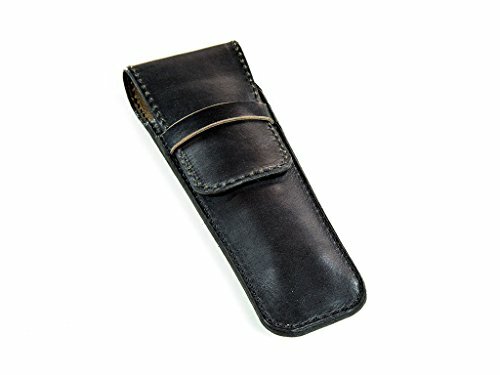 We make this pen case using genuine vegetable tanned Horween leather. Horween Leather Company is one of the most prestigious tanneries in the USA and the only one located in Chicago. This leather is still made by hand the same way as generations ago and rather than wearing out it develops a beautiful patina over time. This quality leather pen case can be personalized with your name or initials. The default font is Arial 5 mm in height. The default location is bottom right on the front. The embossing up to 3 symbols is included. If you need the longer inscription, please, contact us for a custom order.